Confidence in the Eurozone tumbled yesterday as economic data seemed to confirm Mario Draghi's warning, with a drop in consumer prices. Even the German unemployment figures disappointed, casting further doubts over the health of the European economy and adding to speculation that more stimulus is needed. 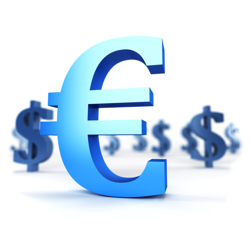 Consequently, the euro resumed its decline against the dollar, losing 11 points down to $1.3182. We saw bargain hunters coming into the shared currency yesterday to take advantage of a perceived opportunity, with the EUR/USD pair gaining back 24 points to $1.3192. It's true that speculation about imminent European quantitative easing has cooled, but it takes a lot of courage to bet against the dollar at the moment especially versus the euro. The shared currency is showing no sign of bringing its slump against the US dollar to an end since the ECB appeared to concede that it may need to use QE. Spread betting investors are now speculating that monetary stimulus will soon become official on this side of the Atlantic, whilst the Fed could move towards interest rates hikes. This provided the ingredients for ongoing greenback strength, which yesterday gained another 25 points against the euro to $1.3167. Comments made by Mario Draghi fuelled speculation that the European Central Bank is getting ready to use quantitative easing to spur economic growth. In contrast, the Federal Reserve is expected to raise rates sometimes in 2015. This divergence continues to weigh on the EUR/USD pair, which yesterday slumped below the $1.32 level to close at an 11 month low of $1.3192. It seems that the greenback is looking particularly strong given that the US economy expanded by more than expected last month.